Whenever I sat down to do the back stitching on the owl, someone would come, or would phone. By the time they'd gone, Daniel would be back home. It seemed to take ages before I could get this section finished. It's now done and a start has been made on the foliage that goes at the top right. Just a little bit of that to cross stitch and outline, and I can turn over to the last page. It's only about a third of a page, so I'm hoping it won't take too much longer to do. 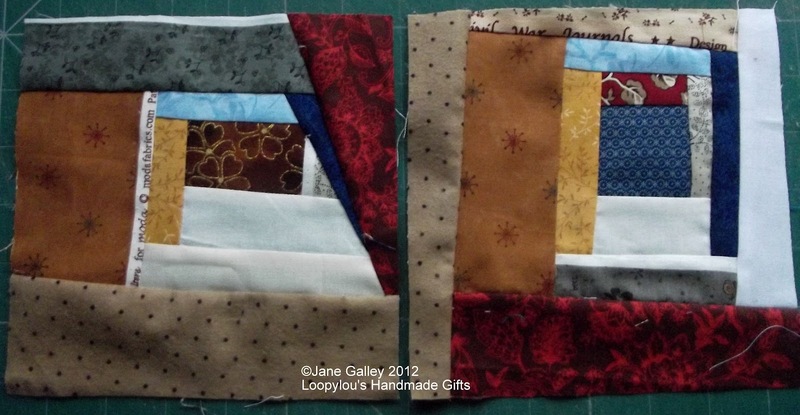 Before he went out, I did get two more crumb blocks done to add to the bag. 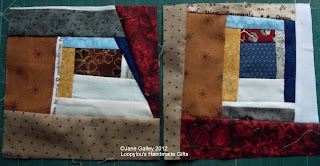 It won't be too long and I'll decide on sashing fabric and make up a quilt. There's just a couple more projects to finish up first. Your owl is lovely, really taking shape now. Owls are looking good. It is good you can do the blocks anytime you have a few minutes and they do pile up after awhile. Well done on the owls! I can't wait to see your crumb blocks all laid out together! 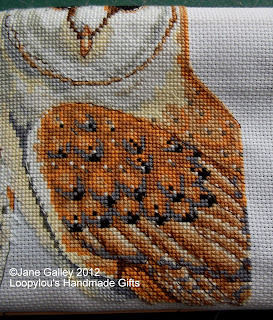 The owl's feathers have so much depth and definition now. Beautiful. Your owl is so pretty and I cannot wait to see them finished. Your crumb blocks are coming along nicely and will look good when put together.